Epiphanies, eurekas, sudden realizations—every person comes across such at various points in life. That is the time everything falls into place. Suddenly, you know what your next step is. Suddenly, you understand why you are here at this very moment in this very place under these very circumstances, doing what you’re doing for this very purpose. I’ve had three suddenlys, so far: one in the middle of my grade school graduation speech; another while drunk on a rooftop bar in Zambales, listening to the ocean; and the most recent one in a smoke-filled bar along a random Cubao eskinita, pushing my way through what seemed like hundreds of people rushing to get their hands on self-published stories. I was at a small press expo called Better Living Through Xeroxography, or BLTX. I don’t know if it was because I’ve never been with so many writers in a single space, and I’d been smiling at each cluster of faces huddled over their tiny, stapled masterpieces as I flipped through them. I don’t know if it was because I was fascinated by how everyone knew everyone, and it seemed like this one night was just as much about friendship and reuniting as it was about writing and literature. I don’t know if it was because I am at the point where I have all the opportunities to switch roads, start new chapters, leave everything behind now instead of later, because now I have less to lose. I don’t know if it was because in that moment, I wasn’t sure about writing. The thing is, I’ve always been intimidated by ‘writer events’, partially because I’m only fifteen, but mostly because I get anxious at the thought of having to measure up to talented writers, both experienced and just starting out. The thought of having to arrange my work on a table and watch people pick those of others over mine seemed incredibly terrifying. But with every event I expose myself to, BLTX being the latest, I’ve come to find that a lot of these mental hang-ups are either untrue or exaggerated. 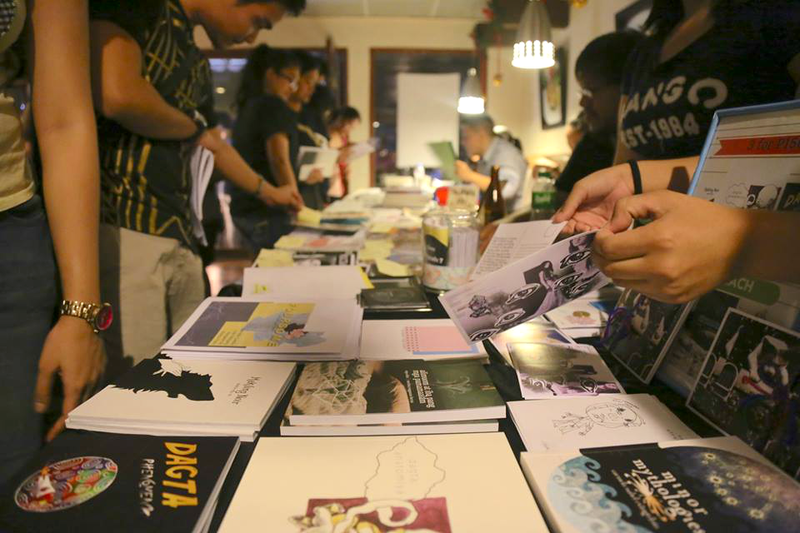 I didn’t get to put out a zine for the event due to prior commitments (thesis), but based on the dynamic I saw take place, people took chances, and everyone was excited about everything. I loved seeing the expression on writers’ faces when somebody decided to buy their zine. It was almost like they couldn’t believe someone wanted to not only read but also pay for their work. So there, at the farthest edge of the room, standing on my tiptoes so I could take the whole thing in, I started to think about each of the times I felt like I was at the beginning of something amazing falling into place. I decided that moment was one of those, except this time around, I was right inside it. Maybe it’s just an idea in my head, and anyone who reads this is welcome to tell me the actual truth, but I’ve always known that events like BLTX, complete with tiny printouts of my poems and writer friends and alcohol, will be a significant part in my future as a writer. Because it’s important to be part of a community, and it’s important to get our writing out there, even in the most underground outlets possible, while waiting for mainstream publishing to be revolutionized.